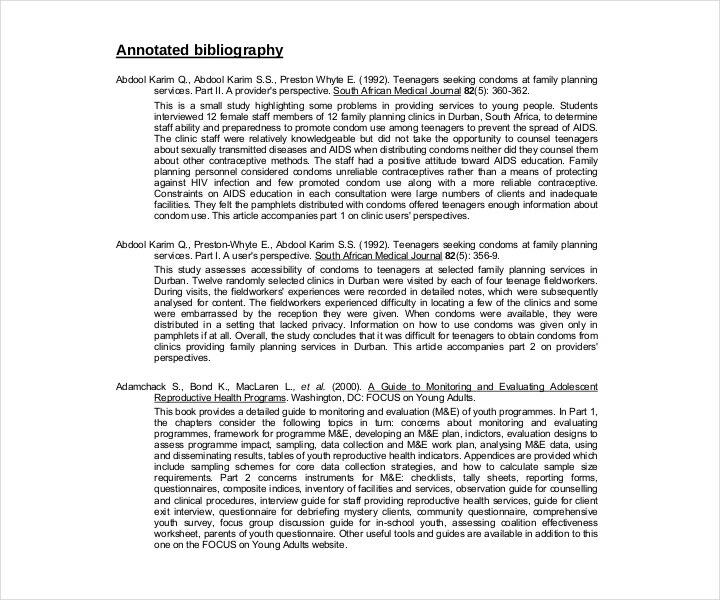 For those who do not know what a bibliography is, it’s a part of any research paper or report that contains the sources of information used as a reference for one’s work. 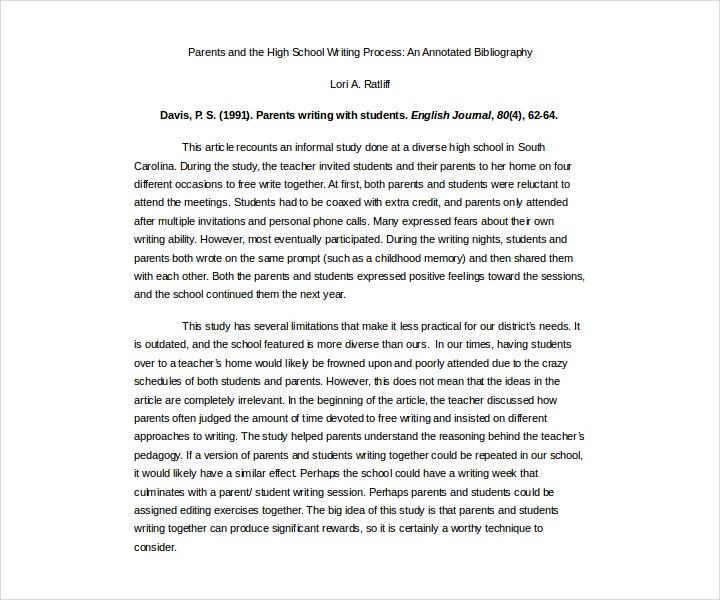 With the help of a bibliography, others who read your research will easily be able to understand where you were able to get the thoughts and ideas that you’ve included in your paper. The bibliography is basically a list of all the books, articles, web pages, and just about any other reference cited or used. 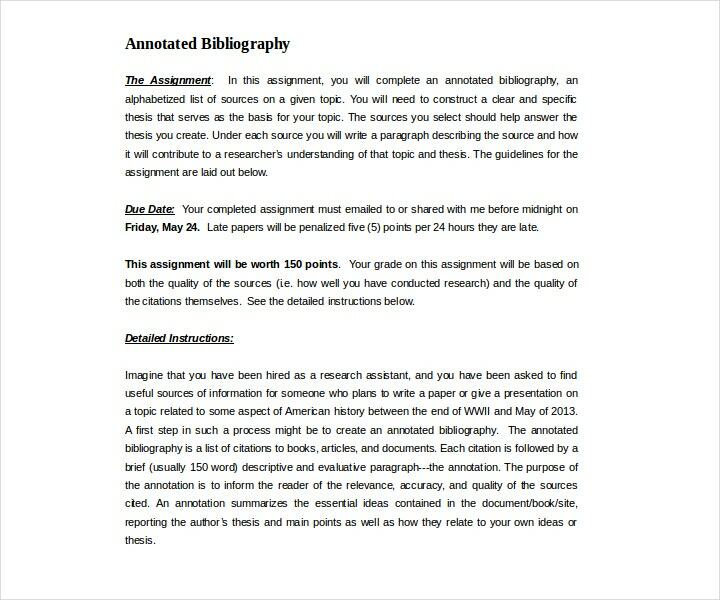 It also has many different styles, which is why this article will focus on helping you learn how to be able to write a bibliography as well as understand how it works. 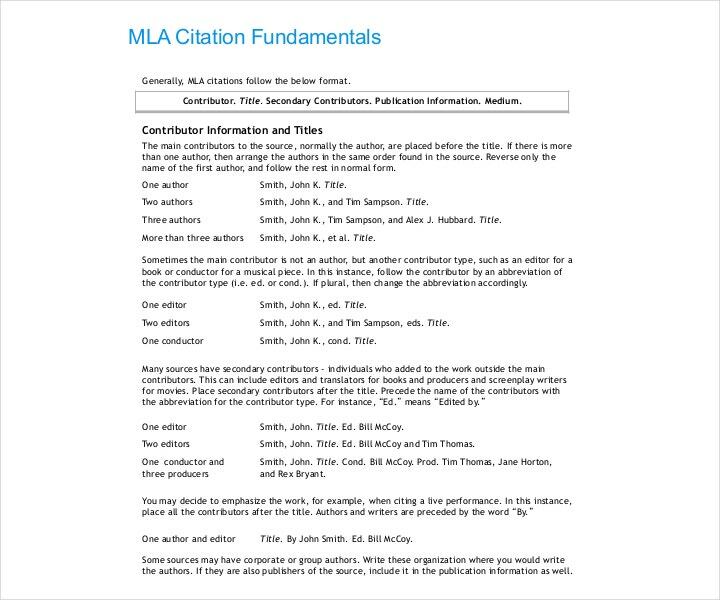 What Is a Citation and a Citation Style? 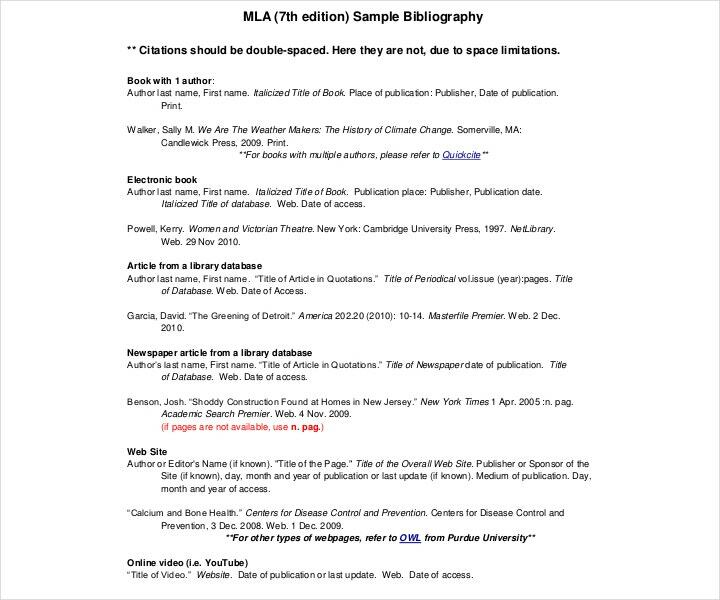 If you want to learn more about bibliographies, then you’re going to have to learn two things: citations and citation styles. A citation is basically a way for you to give credit to the work of others that you have made use of to support your own research. It can also allow you to locate particular sources as well as combat plagiarism. A citation would contain the name of the author, date of publication, location of the publication company, journal title, and the Digital Object Identifier (DOI). 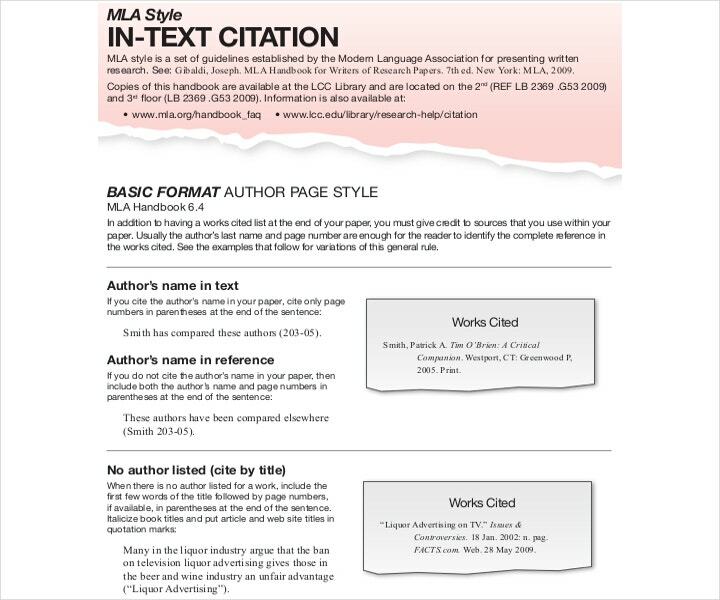 A citation style is what dictates the information that’s necessary for a citation, as well as how the information is ordered, its punctuation, and other required formatting. APA style originated in 1929 when a group of psychologists, businessmen, and anthropologists came together to discuss and establish a simple set of procedures, or style rules, that would increase the reading comprehension of those going over any scientific writing. Just like every other style, this one contains guidelines and rules that publishers have to observe to ensure the clear and consistent presentation of any written material. It makes sure that the tone, length, abbreviations and punctuation, citation of references, and other elements are used uniformly. The APA style calls for three different kinds of information that have to be included within the text citation. The first two would be the author’s last name and the date of publication. These two must always appear and must match the corresponding entry within the reference list. The last one, the page number, appears only in a citation to a direct quotation. 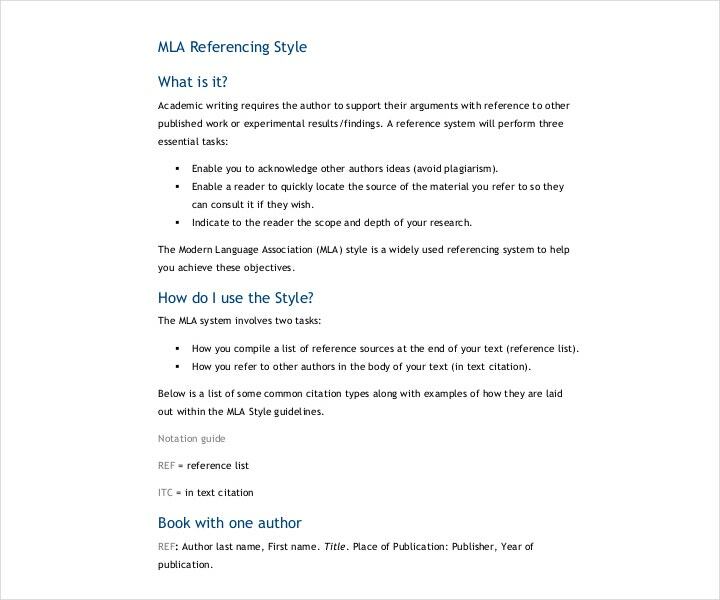 MLA style bibliography is widely used in the humanities, especially in writings on language and literature. This kind of style features brief parenthetical citations in the text that is keyed to an alphabetical list of cited works that appears at the end of the research paper. The concept of containers is crucial when it comes to the MLA style. If the source that’s being documented is actually a part of a much larger whole, then the much larger whole can be thought of as a container that holds the source. One must also remember that each entry that’s listed is composed of facts that’s common to most works. These are the MLA core elements and they’re also assembled in a specific order. Chicago style was published by the Chicago University Press in the year 1906. It can be likened to the more modern Turabian style. This kind of citation style incorporates the rules of grammar and punctuation found in American English. The Chicago or Turabian style presents two basic documentation systems: (1) notes and bibliography, and (2) author-date. The notes and bibliography style is preferred by many as it presents bibliographic information in notes. The author-date system briefly cites the sources in text, usually in parentheses, based on the author’s last name and the date of publication. When choosing between the two styles, it depends on the subject matter and the nature of the sources that have been cited. 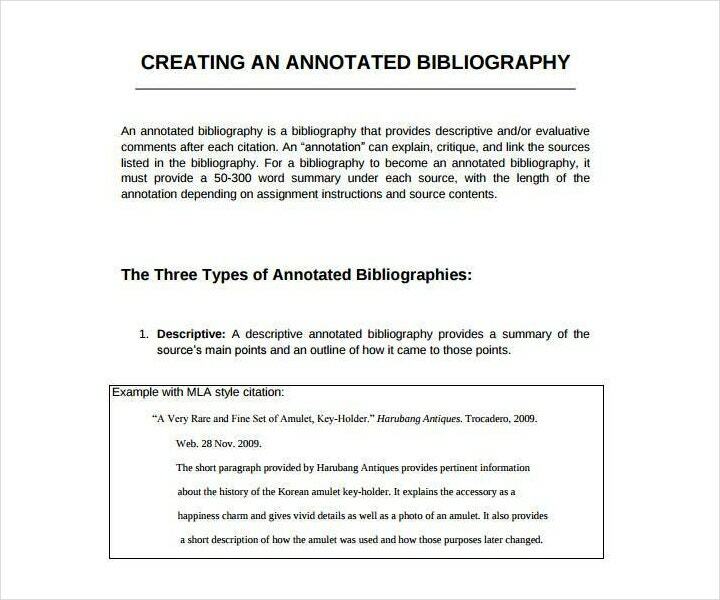 Before one can know about annotated bibliographies, it’s important to know what an annotation is first. An annotation is basically a brief summary of any article, book, web site, or just about any other type of publication. An annotation is supposed to give the reader enough information to make a decision based on whether he or she should continue to read the complete work or not. Basically it tells a person if the material used is useful to the research and, if so, why? To provide a literature review on any particular subject. To provide descriptions on certain items that allow readers to see if they have an interest in a certain topic. To help one formulate a thesis on a specific topic. To provide major sources of information on a topic. To demonstrate the research that you have conducted on a particular topic. Descriptive or informative type. 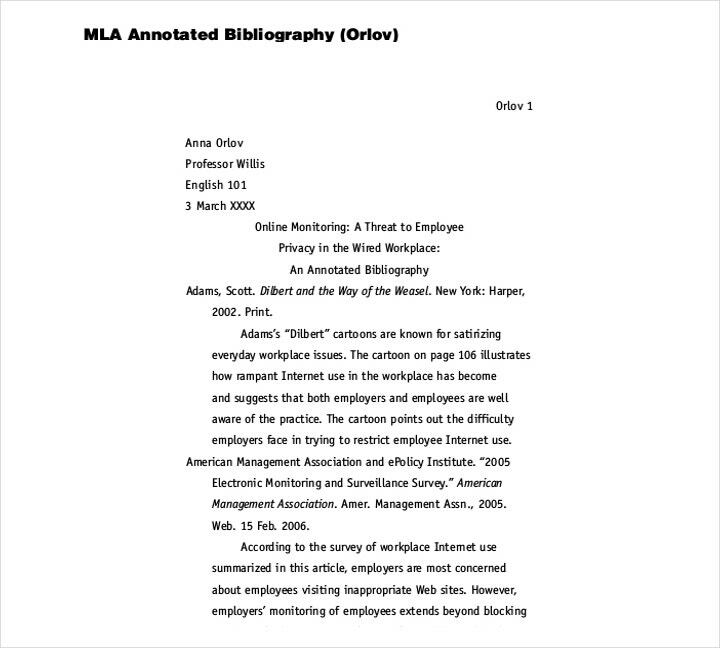 A descriptive or informative annotated bibliography is what one makes to describe or summarize a source. It allows one to easily describe why a source is useful for researching a particular topic or question. In addition, one can use this type to describe the author’s main point when it comes to his or her work without evaluating anything that the author has said or making any conclusions. Analytical or critical type. This differs from the descriptive or informative type because it not only summarizes the reference material, it also analyzes what the author has stated in his or her work. It basically allows you to evaluate the material’s strengths and weaknesses and describe its applicability to one’s work based off of the author’s conclusions. Make sure that you create a reference list. 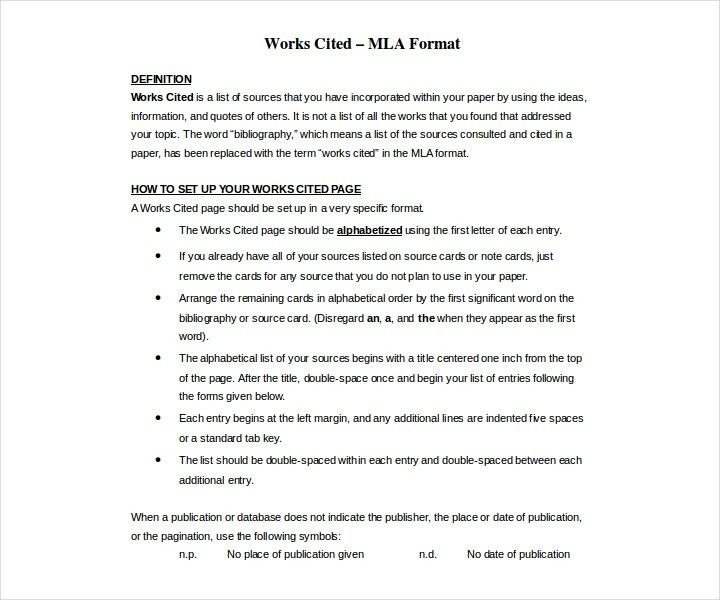 This is the first step that you have to take as it is important that you reserve a page at the end of your paper for the bibliography. You must then title the page as “References”. Under this heading, you will be listing down all of the different sources that you have used in your research. Sort all of your references alphabetically based on the author’s last name. When you’re doing this, you have to use the author’s full last name and then the author’s first name and the middle initials. In the event that there is more than one author in a particular reference, then you should list the authors based on when they first appear in the source. In the event that there are more than seven authors, then you’re going to have to make use of an ellipsis. The first thing you’ll need to do is list the first seven names that appear within the source, and then place an ellipsis (that’s a set of three periods). After you’ve finished writing the ellipsis, place the name of the last author that’s listed in the source. If you’re going to list sources that were made by the same author, then you have to make sure that they are in chronological order. This also depends on the type of paper that you are writing as there may be times where you’ll find multiple sources that fit well into your work, but are all written by the same person. You’ll have to start with the source that was published first and then list the rest of the sources chronologically. There will be times where you’ll find sources that were published by an organization or those that don’t have any author at all. If the organization is the author, then all you have to do is write the name of the organization. If there’s no author, then all you have to do is write the title of the source. 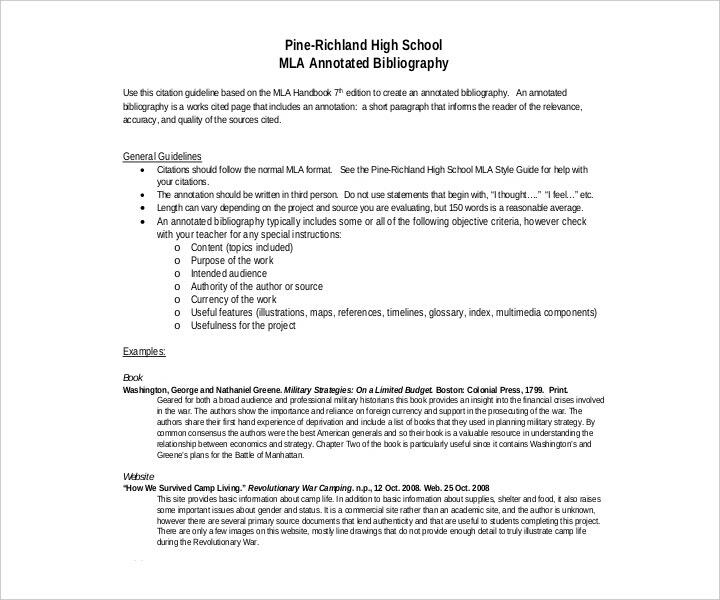 Let’s say that you’re using Microsoft Word to make your bibliography, you have to make sure to indent each line after the first line of your source. So if your source ends up taking more than one line, then you’re going to have to indent each succeeding line by 0.5 inches (1.2 cm). When you move on to the next source, that’s when you can start at the original margin of the paper again. If you’re going to cite articles, such as a newsletter article, then make sure you start with the author’s name, followed by the year, then the title of the article, the name of the publication in italics, the volume and issue numbers (if there are any available), and the number of pages that were referenced. If the article you’re referencing was retrieved online, then end the citation with the words “retrieved from” followed by the web address. 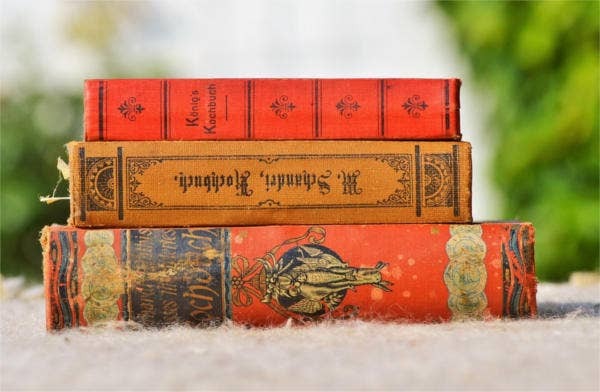 If you’re going to cite books, you’ll have to start with the author’s name, followed by the year of publication, then the title of the book in italics, the location of the publisher, and lastly the name of the publisher. In the event that the title is more than one word long and does not contain any sort of proper noun, then make sure that only the first word is capitalized. You should also make sure that only the first letter of any subtitle should be capitalized as well. Remember this if you’re going to make a book order and plan on using any particular book as your source of reference. When you’re citing websites, all you have to include are the author’s name, the complete date, the title of the web page, and then the words “retrieved from” followed by the web address. In the event that there is no author available, then all you have to do is start with the title. If there’s no date, then you can simply write “n.d” in the bibliography. Remember this and make sure you keep a list of different web pages you have visited to find the source of information that you’re going to use for your work. If you’re not sure about the rules regarding citations, then you can always look at reliable sources online. No matter what kind of bibliography you’re making, there will be rules that you will have to follow. So it’s best that you make use of online sources such as the Purdue University’s OWL (Online Writing Lab) website to help you out. 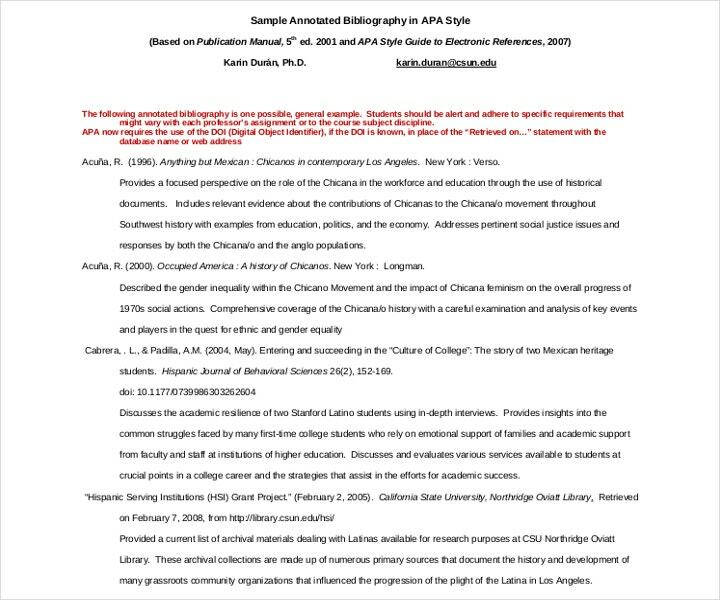 As long as you’re able to understand the key difference between an annotated bibliography and a traditional one, then making one shouldn’t be a problem for you. 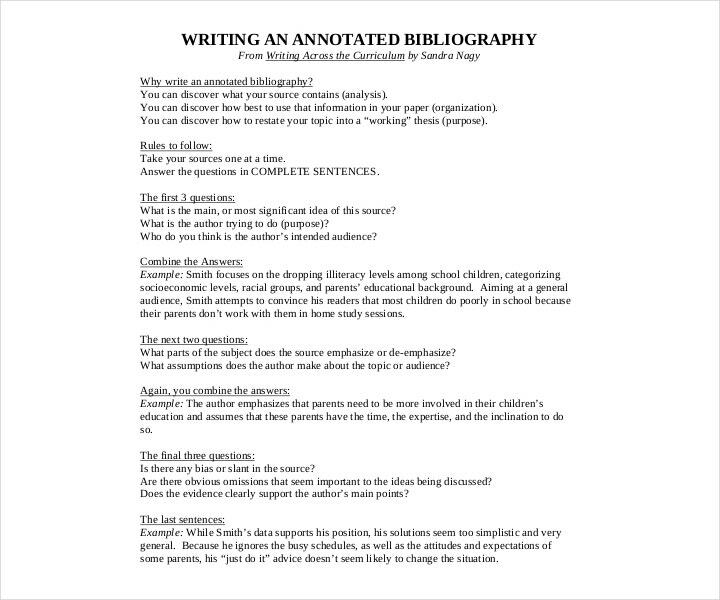 So below are the steps that can help make sure you create a proper annotated bibliography. You must first determine the needs of your project or your assignment. 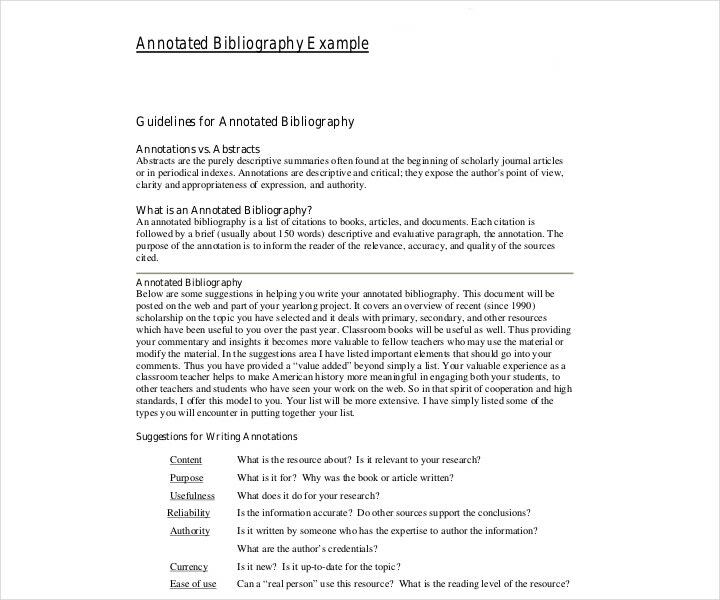 As mentioned when discussing the two types of annotated bibliography, an annotated bibliography summarizes the sources that you have found and used while the other one evaluates the main point of the source. So to help you know what kind of sources you need to look up and make use of, it’s best that you keep in touch with your teacher or your professor to help you understand the particular requirements of your project. You’ll have to summarize each of the sources that you’re using. Describe the source’s approach to the topic and how the author was able to make his or her point. You’ll need to take a look at what the source is discussing, what the source is arguing about, and what the source is trying to make you believe. Just try to think of it as a summary on how you would describe the information to someone if you were asked about it. The length of the summary will depend entirely on the needs of your research as well as the type of source used. Provide evaluations with your annotations. If you’re required to not only summarize, but also evaluate your annotations, then the next thing that you should do is go over the source and evaluate all of its strengths and weaknesses. You should determine the answers to questions that ask the usefulness of the source, any biases that the source contains, its reliability, the ways that the source can help understand the topic better, and any aspects of the source that might just be undeveloped, lacking, or even misleading. Describe how your sources compare to others. 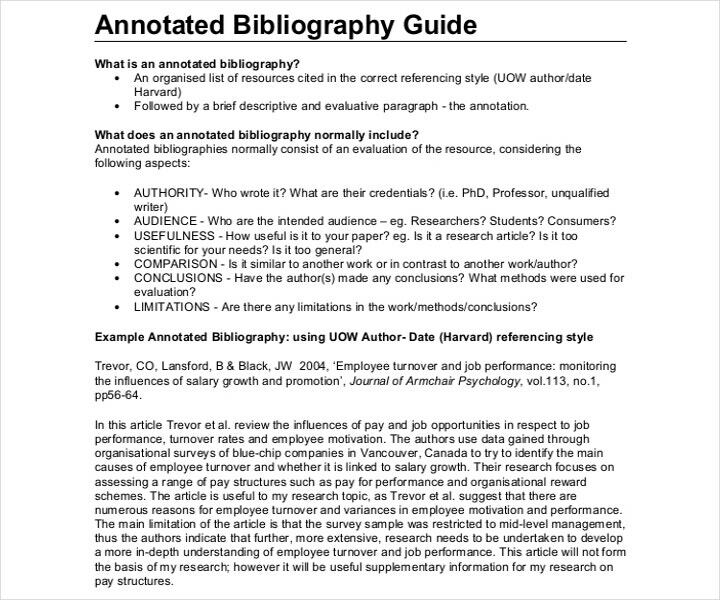 Considering that an annotated bibliography is meant to give an overview of the research on a particular field, then it would help to understand how each of the different sources used stand in relation to one another. You should be thinking about things like how any of the sources quote from or respond to the ideas of the others, if the sources overlap in terms of content or approach, the important differences between the various sources, and if any of the sources are better than the other in any particular way. Reflect on the usefulness of each source and if they fit into your research. Spend a little time thinking about how each of these sources contribute to your research project. You need to see if these sources allow you to draw facts or important quotations, borrow methods you can use for your own analysis, agree or argue with it, use its findings to support your own, and basically other wys you can use it in your project. In an annotated bibliography, it could be selective wherein you just choose a few representative sources, or it could be comprehensive wherein you are going to have to summarize all of the major findings on a particular topic. Either way, you’re going to have to make sure that the sources that you have chosen are reliable and of high quality. What you should generally look for are scholarly sources that are published in academic journals which were published by authoritative publishers or well-established websites. 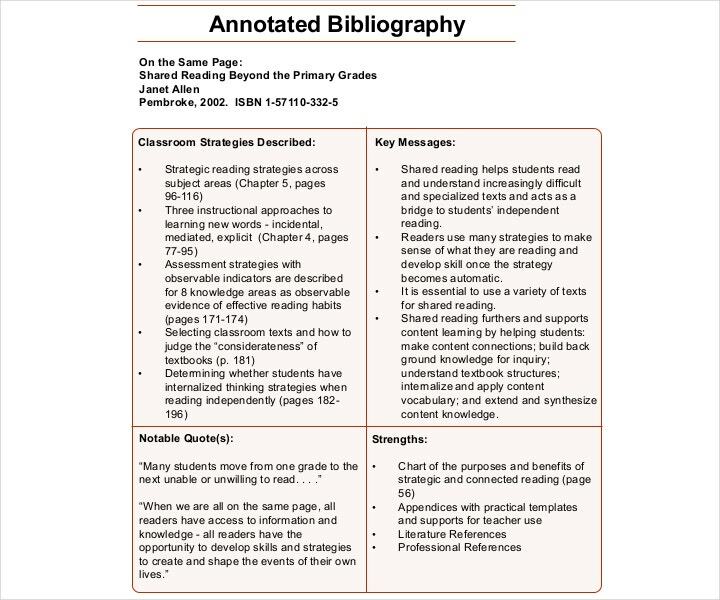 Be sure to provide the full annotation to each of the sources that you have used. 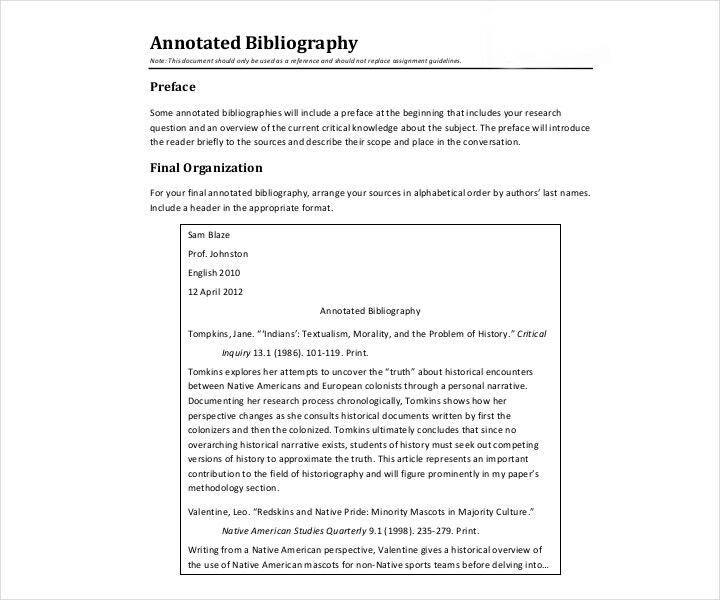 In addition to the annotation, you have to make sure that the basic bibliography information such as the name of the author, the title, the date of publication, etc. are provided for the source. The exact style that you want to use (whether it’s MLA, APA, or CCS) depends on the type of project that you’re making. Just ask your professor or teacher if you’re unsure about which style to use. Make sure that you properly format your bibliography. 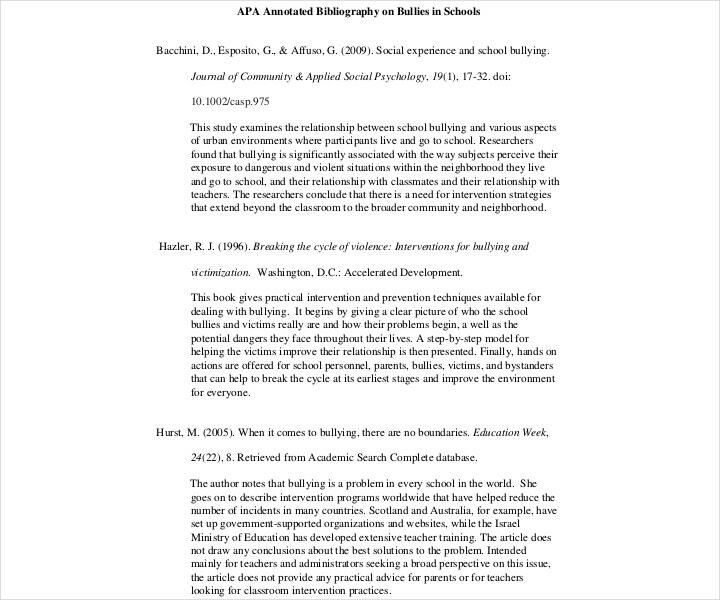 For most cases, you’re going to want to format your annotated bibliography as a series of entries. At the start of each entry, you’ll have to give the full citation of the work. 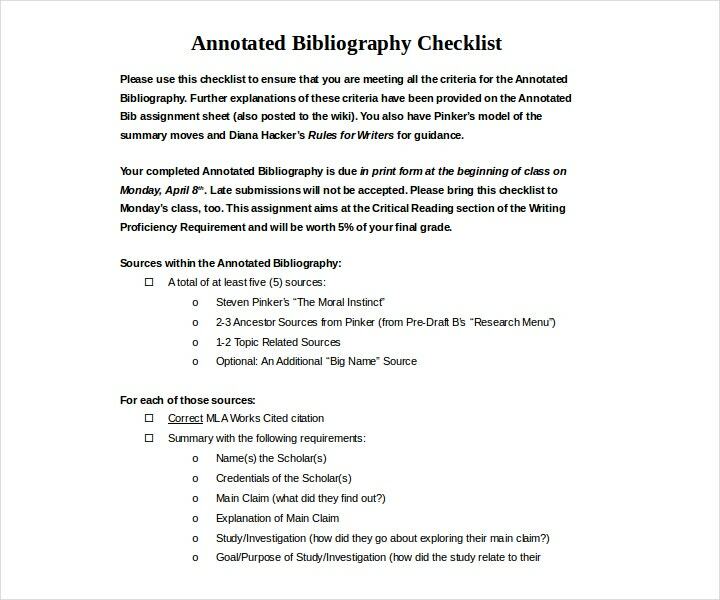 Next would be for you to follow it up with your annotations that summarize and evaluate the different sources in your annotated bibliography. Make sure that both the summary and evaluation are in paragraph form. Know how to organize your entries. 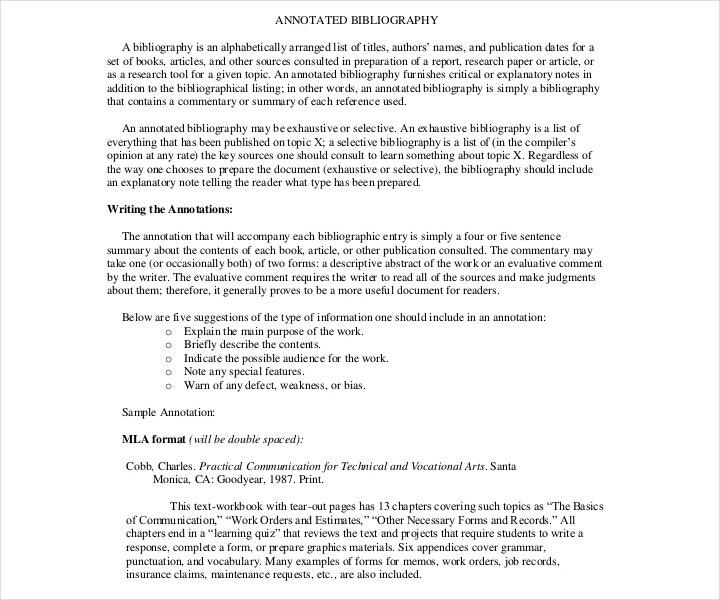 In most cases, annotated bibliographies are arranged alphabetically based on the last name of the author. However, there are other organizational styles that make sense and are acceptable to your professor or in your particular field. For instance, you could arrange all of your entries chronologically in the event that you would like to stress the development of your topic over time. You can also arrange your entries based on the subtopics or based on the different formats (books, articles, websites, films, and more). Just make sure to ask your professor or teacher to ensure that your organization makes it easier for others to find these sources. 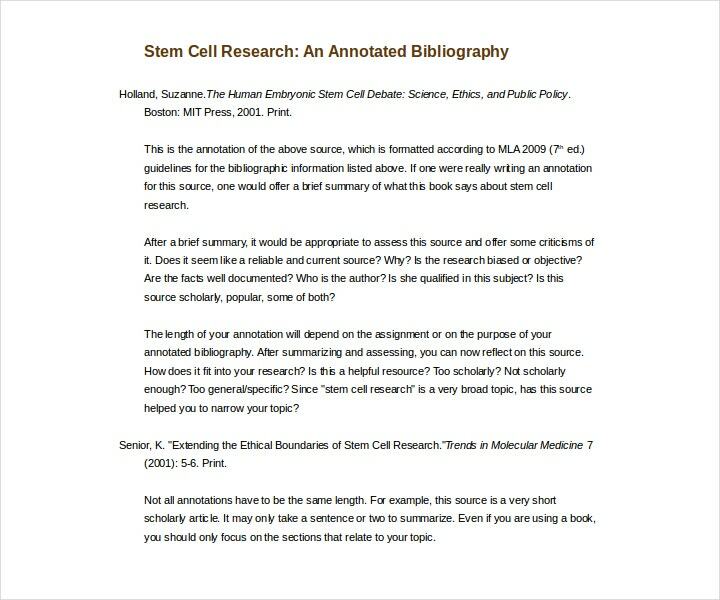 Bibliographies aid researchers when they have to develop their own work during the early stages. It makes it much easier for them to see if the sources of information contained in these bibliographies are relevant in their own work. Also, those who are required to make annotations can ensure that their information is verified by making certain that they do in-depth research of all sources used as well as compare them to formulate opinions. So by going through the bibliography and reading the work of the original author, you can see if the research paper of another was done through extensive research, or if that person just took a look at a few references. The bibliography is also a great fact-checking tool. By using the bibliography, one can go over all of the references to verify the accuracy of the information that the reference provides. 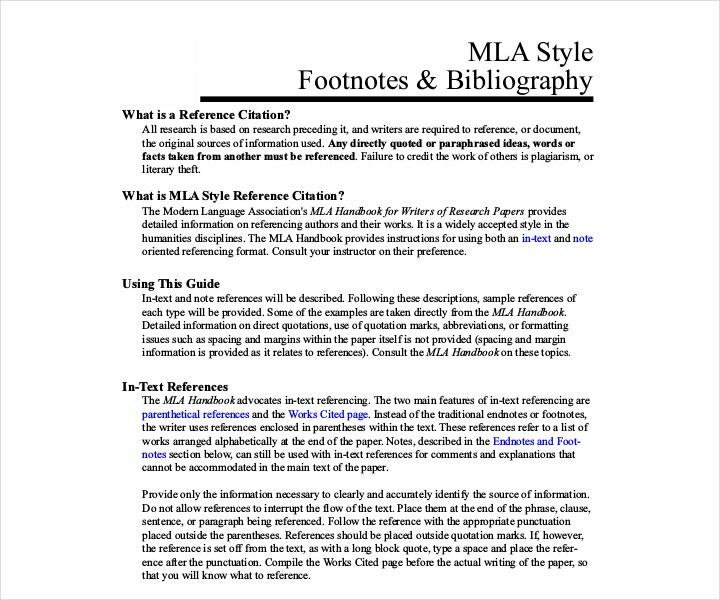 If you’re making annotated bibliographies, then this will also make you a better writer and researcher as you have to go through everything that you have understood about the reference and see how it contributes to your work. Once you’ve figured that out, you’re going to have to come up with an evaluation that will tell others how it contributes to your work. Doing this can help impress your professors as well as make sure that you’re able to properly understand all the references that you have used. So in the event that you would like to know more about bibliographies, or if you would like to make them yourself, then you can check out other available samples on our site that will provide you with tips on how to write a bibliography.